Operation run test as per NFPA 20, UL 448 requirements. Vertical turbine models for capacities from 50 to 1500 US GPM. Rugged construction for longer service life. Specifically designed for fire fighting applications as per NFPA 20. Excellent mechanical and hydraulic design characteristics for efficient performance. Suction bell is furnished with an extra long bearing that strengthens and provides rigid support for the lower end of the pump shaft. Suction bell provides efficient flow into the eye of the first stage impeller. 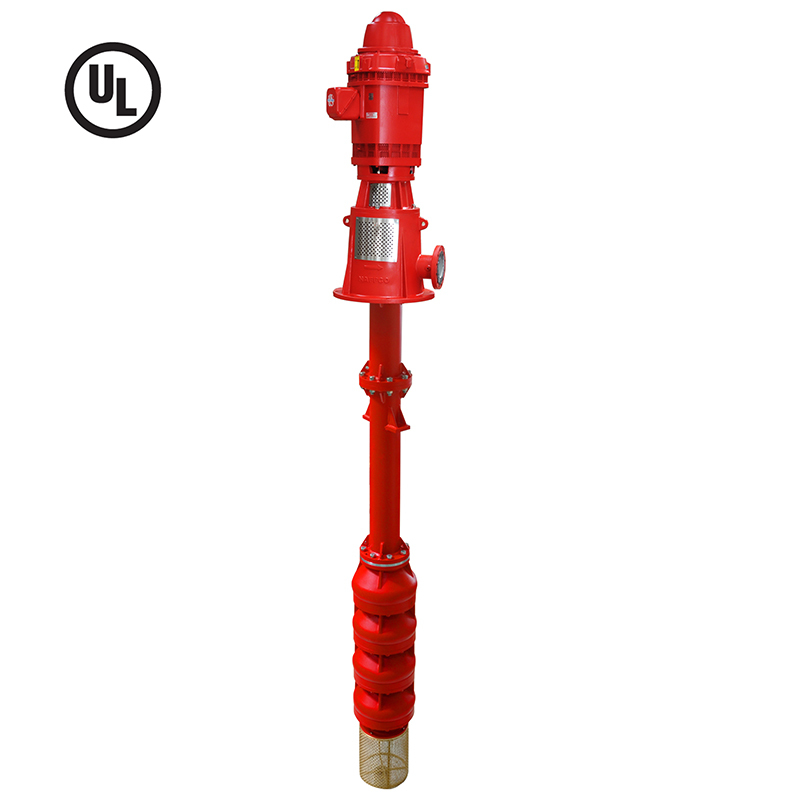 The rugged pump discharge head assembly is made of close-grained cast iron. It has smooth passageways that ensures efficient overall operation and provides an above ground connection to the discharge piping. The pump bowls have vanes cast integrally in them. These vanes are designed to match accurately with the impeller, and are smoothly contoured to guide the flow to next stage with maximum efficiency. Impellers are enclosed type, made of bronze / SS 304 and matched to the pump bowls. Each impeller is statically / dynamically balanced as per ISO 1940-1 to insure highest efficiency and vibration free operation. Pump column pipe shall be in sections not longer than 10 ft each. Column pipe is flanged type. Flanged connections are accurately machined to accept bearing retainers and are bolted together securely for proper sealing. The shaft sealing is gland packing type. A lantern ring is furnished between the packing and it relieves pump pressure from the upper packing rings by bypassing the high pressure water through its relief ports.